The service has bolstered hiring tactics in recent months but the latest video shows a more fun side to the force. The New Zealand Police Force has taken a serious approach to recruitment over the past few months – rolling out a number of hard-hitting advertisements – but now, the department has offered a glimpse into the more jovial side of the job. 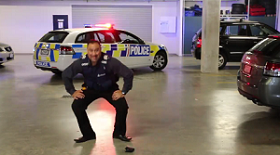 Yesterday, NZ Police Recruitment posted a video on its Facebook page showing a number of officers participating in the latest internet craze – the Running Man Challenge. While eight team members are included in the clip, one man in particular stole the show, taking centre stage to showcase his enviable dance skills. It’s been a phenomenal success and in less than 24 hours, the video has already received more than 114,000 likes and has been viewed over 4.2 million times. The video is the latest element to the police force’s ongoing recruitment campaign which has a goal of hiring 400 new officers for next year. Its previous videos and printed advertisements – which make up the Do You Care Enough to be a Cop campaign – have focused on the identifying the right type of candidate rather than showing the employee culture. One is of a young boy eating from a rubbish bin and another of a man passed out on an Auckland street. Police spokesperson Karen Jones said in the first month of the campaign alone, 87 applications came in, and they were from a very diverse range of people. You can view a version of the video below or on Facebook.